First dance at Dixieland CMC for the year and what a great artist we had. Steve was ready ith a wjoke and kept the dancers happy all nigh. Lucky he didn't see Lucy slip though, or she wouldn't have heard the last of it. Thanks to Steve for starting the year off with a bang and Ron and Lucy (and helpers) for organising the night. 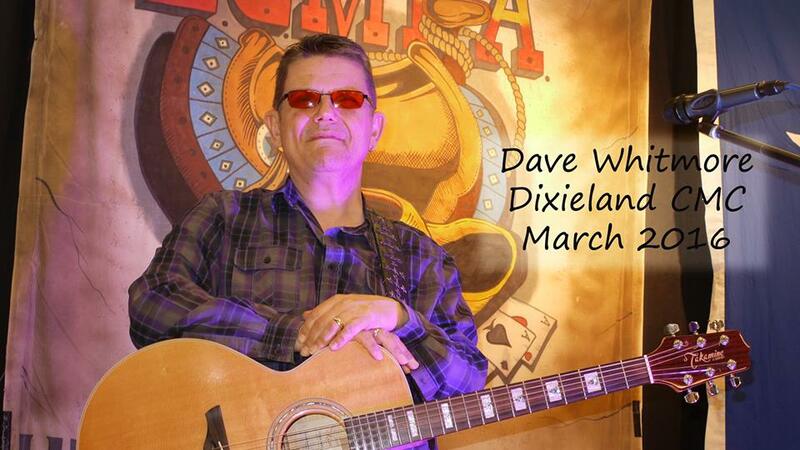 Dixieland CMC, 19th March 2016 with Dave Whitmore. 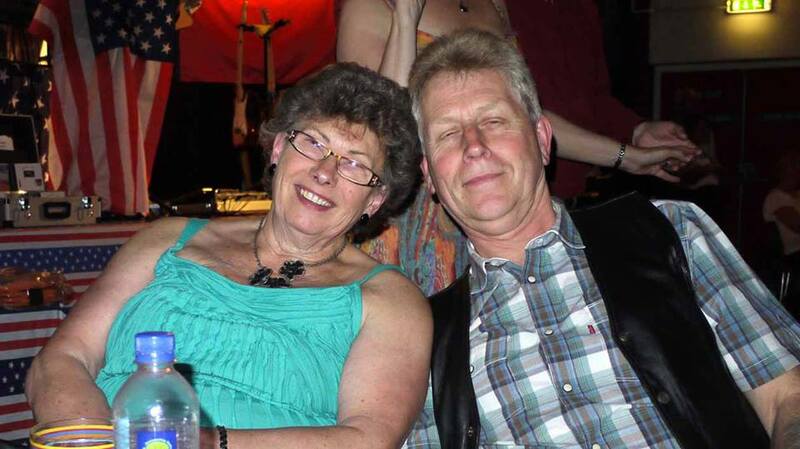 Although Dave is the artist on stage, it's not only him, but his family has a major part in the evening - his wife mixes the music and tries to control the play list whilst the grandchildren enjoy themselves off stage. It all works well and Dave gave us a full evening of danceable country music, not always the usual but never the less very welcome, getting away from the usual tunes. So thanks Ron, Lucy, and helpers, for another enjoyable night. Thanks to Lucy and her little helper ( the Milky Bar Kid) for a great party night with Steve Hanks who gave us three sets of great danceable music. There was cakes, mince pies, sweets, nuts, crisps balloons and Christmas decorations to set the mood for this party. Lucy and Ron thanked their helpers for their input over the year and a gift from some of the classes was given to Lucy while Ron, on horse back, was passing out the Milky Bars. Tex came as Father Christmas and gave ...the Grandchildren some presents. We danced to a good selection of country music and a dance was taught, “Russion Roulette”, we needed a little guidance from Ron, but in the end it worked out well. 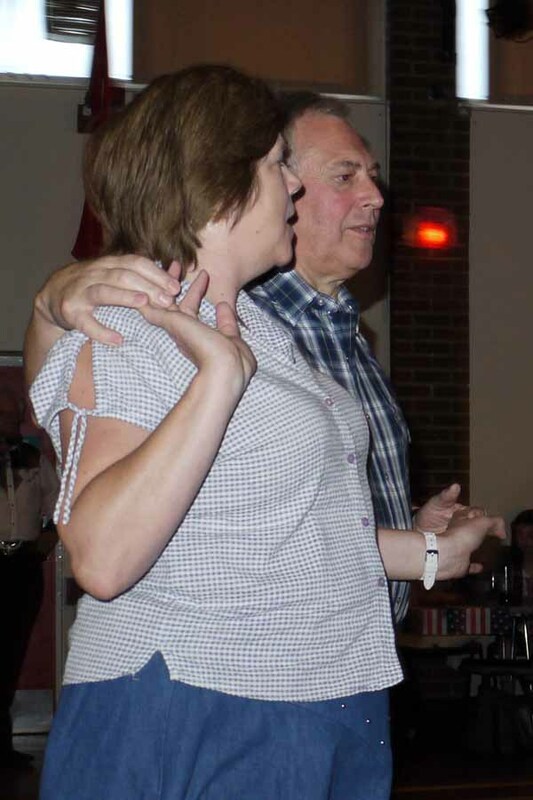 Thanks again Lucy and Ron for all your hard work over the year running the country music dance nights and thanks to all for supporting the Club. Merry Christmas and a Happy New Year. Dixieland CMC, Barton Village Hall, Beds December 2013 with Kay D. Nearly Christmas and everyone out to enjoy themselves and what a treat we had tonight with a welcome return to this lady of country, Kay D. Now married and a mother since the last time she was with us and what a full night of country danceable music we had. 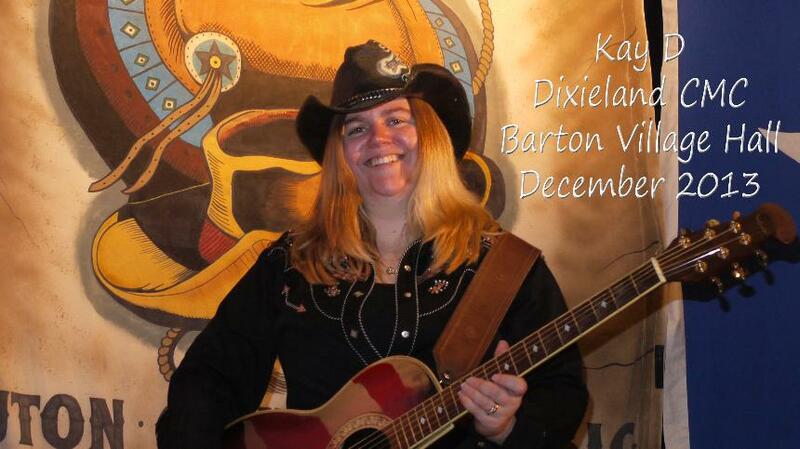 This versatile young lady can sing and sounds as if she enjoys her country music as much as we did. 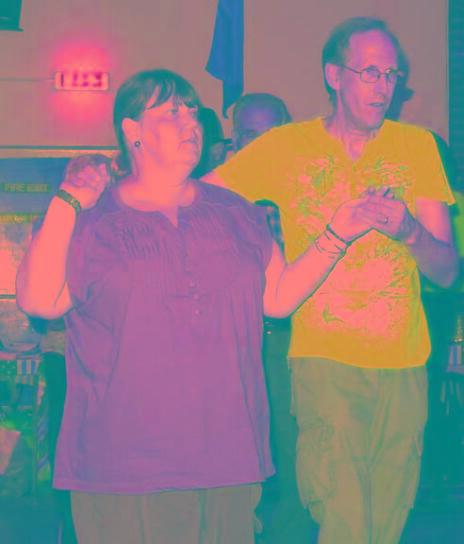 We had a full evening of popular danceable sounds, covering many years. It was a full house tonight with new faces from far and wide, some old friends returning and our regular supporters. Plus a birthday, where the cake was so large, we all had a slice to help Gill celebrate. The evening all to soon came to a close, leaving Kay D to wind up the evening with an encore and thank-yous to everyone for making her evening enjoyable as well. Let's hope we see Kay D back at the club soon and thanks to Ron and Lucy and helpers for putting on another enjoyable night. 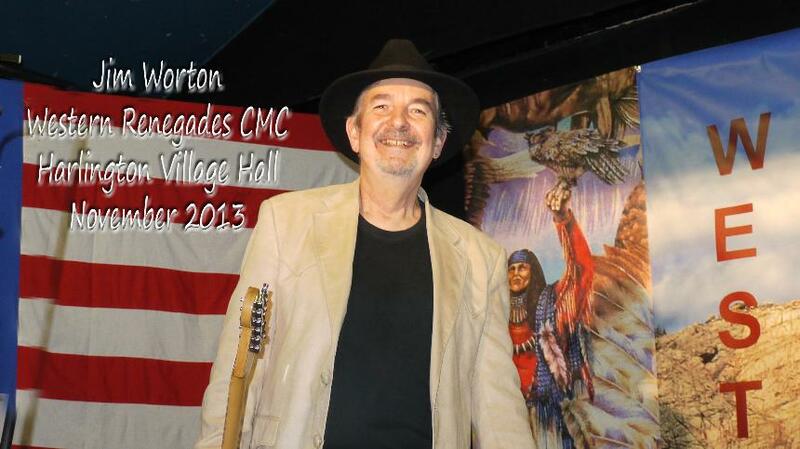 Western Renegades CMC, Harlington Village Hall, Beds November 2013 with Jim Worton. 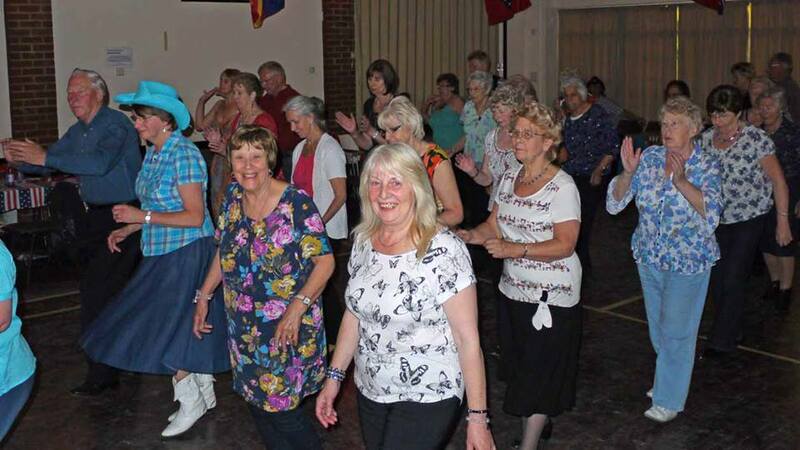 Another successful night with everyone enjoying themselves: dancing to Jim Worton and feasting on Baked Potatoes with chilli sauce or baked beans, not to mention fresh fruit followed by ice-cream. I don’t know how Ron and Lucy pull all this together and still have enough energy to enjoy the evening themselves. 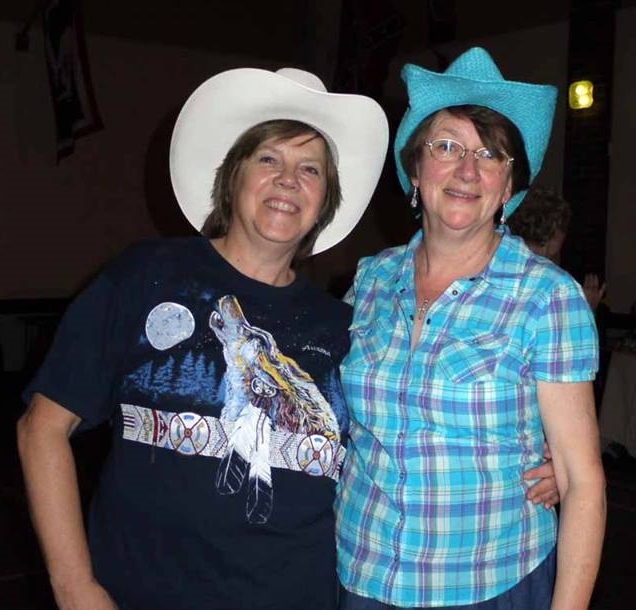 We had a full house tonight with the floor filled with partner and line dancers: It was nice to see everyone joining in and having a good time. We kicked off the evening with Lucy playing some real “Blasts from the Past”, that not only got everybody thinking but also dancing and set the mood for the evening. 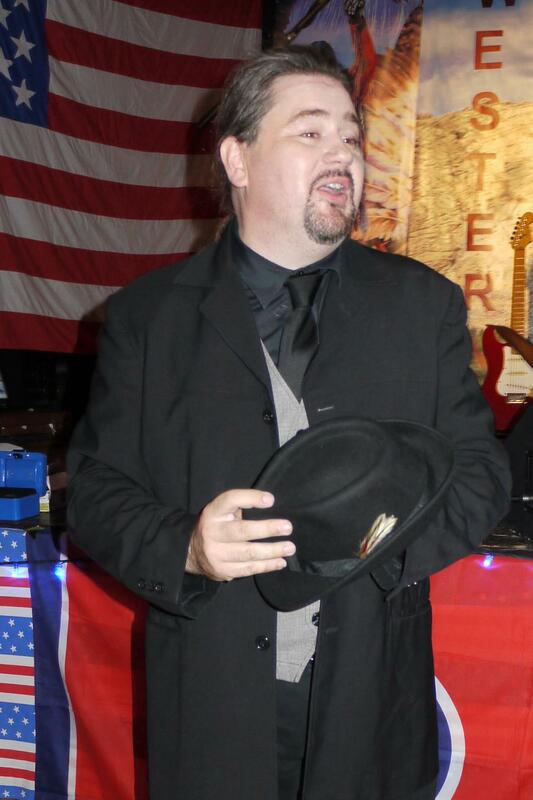 Dave our MC introduced Jim Worton who gave us three sets of good danceable new and old country music. The first break saw us enjoying the buffet and in the second we had a raffle with Dave reminding us that the next meeting at Harlington was soon upon us and that we need to reserve tickets. There were also Christmas and New Year wishes to those who wouldn’t be meeting up again before the end of the year. All too soon the evening drew to a close, leaving Dave thanking Jim for giving us a great night and everyone there for supporting the club. Also I would like to wish everyone a Merry Christmas and a Happy New Year. Dixieland CMC Barton Village Hall, Beds, October 19, 2013. 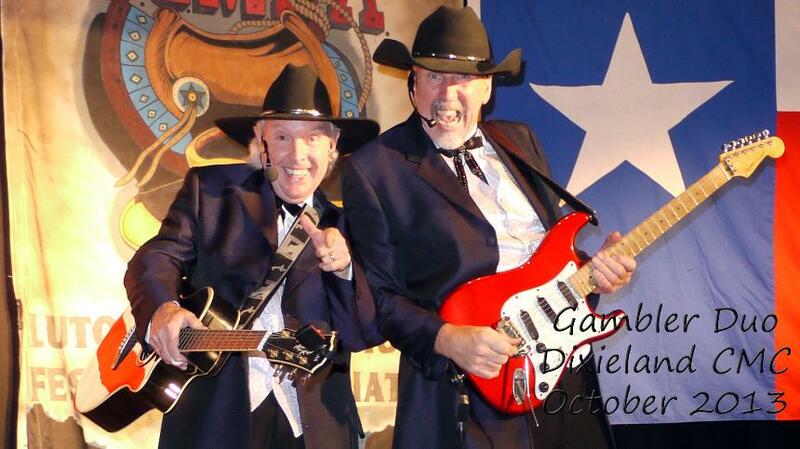 A welcome return visit from Geoff Hilton and Pete Hamilton as Gambler Duo tonight and they didn't disappoint.They couldn't have been more entertaining, professional, personable and good musicians. The first set saw Geoff and Pete extremely smartly dressed in full drape coats, then a change for each set. Last time Geoff jumped off the stage to join the dancers, and he did just the same this time although the numbers he sang suited the listeners better. Geoff and Pete not only played a great selection of music for the dancers, they were so full of energy on stage, they kept the listeners entertained with their lively antics. We had a good mix of old and new dance tunes and unfortunately the the evening was over all to soon, But not before they enticed Ron and Dave(our MC) on the stage to sing us out with "Best of Friends". So thanks to Gambler Duo for a great night and to Ron and Lucy and helpers for organizing the evening. Not to mention everyone there, if it wasn't for their support we wouldn't have a club. 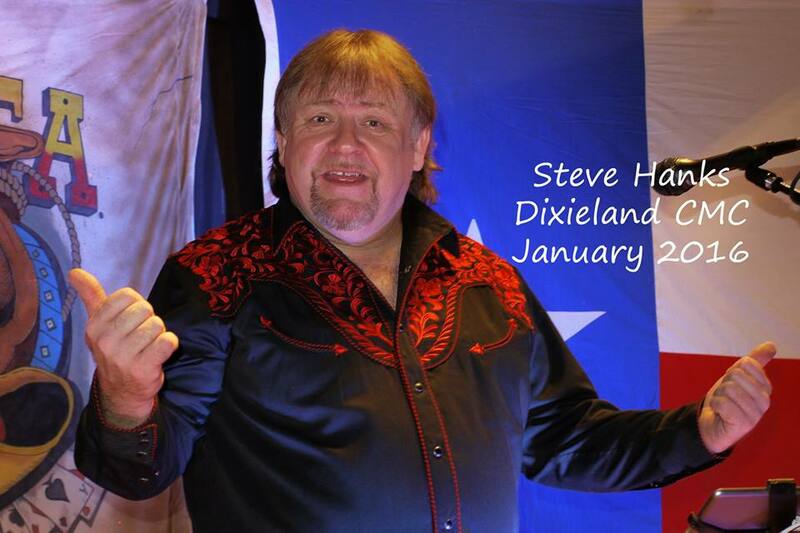 Thanks “Muddy Boots”, another great night at Dixieland C.M.C., one I will remember for quite a while, and one that enables clubs like ours continue to provide LIVE music. Keep it COUNTRY but keep it LIVE. and to finish, a few words from Kay and Andrew of Triple K Western Dancers: Spoilt for choice tonight, should we Line or Partner Dance? Enjoyed dancing to the music of Muddy Boots, a good mix of old and new - from County Line to Borderline. Recommend this band to all dancers and listeners. It must also be mentioned here that as Ron and Lucy were short handed tonight we were greeted by a new duo on the door, Margaret and Ted who greeted everybody and ably handled the ticket money. So thanks again to every one who pulled together to make this a very enjoyable night. Will try not to miss the next one. 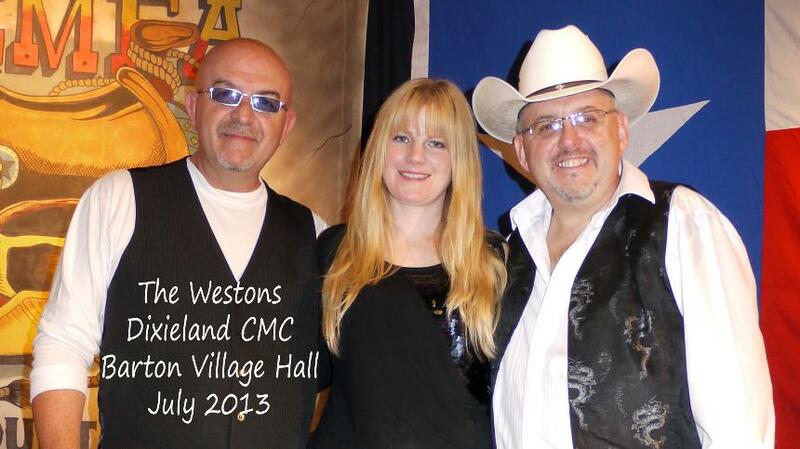 Western Renegades CMC, Harlington Village Hall, Beds, Sept 14th. with Tennessee Rebel (Tony Buckland). There was coffee, tea, cheese, pate, pickles and biscuits followed by melon, a lovely selection to suit all tastes. (and as much as you could eat). 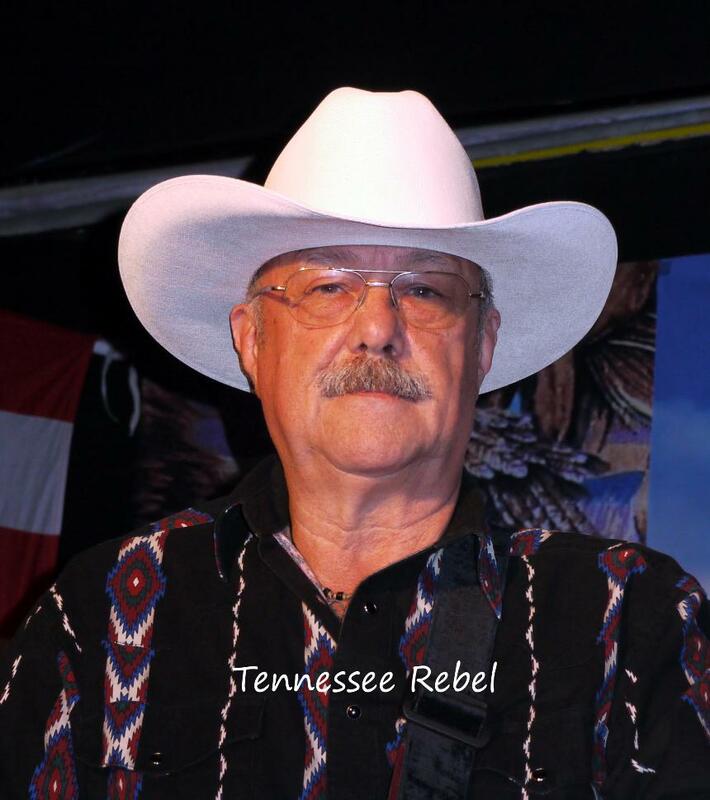 Then there was Tennessee Rebel to make the evening complete, with a great selection of new and old country dance music to keep the floor full all night. This was Tennessee Rebels first visit to the club and I'm sure not his last, as every body enjoyed his warm personality and professionalism. It was also noticeable how smart he looked and how much he was at ease with the audience. Ron and Lucy were short handed tonight, but it didn't show as the hall was decked out with the usual lights, flags and table decorations. 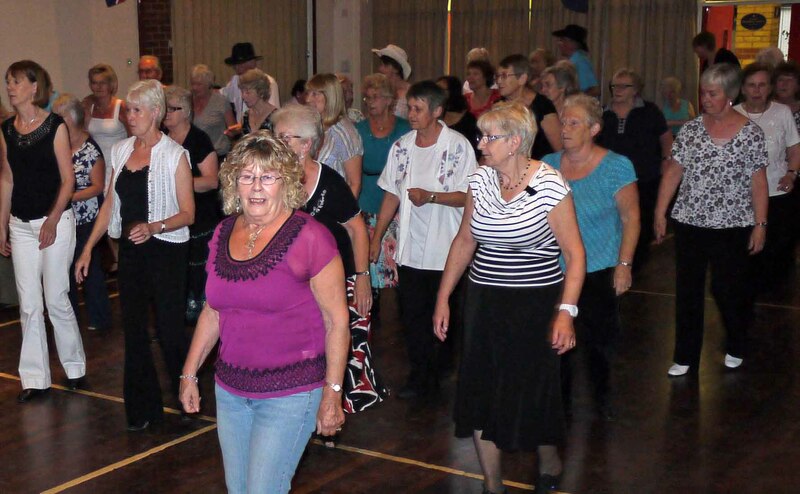 There where a few spare seats tonight, but it was nice to see friends from "High Noon CMC", and "How's It Start Stompers" plus the Harlington Ladies who missed the last meeting here. 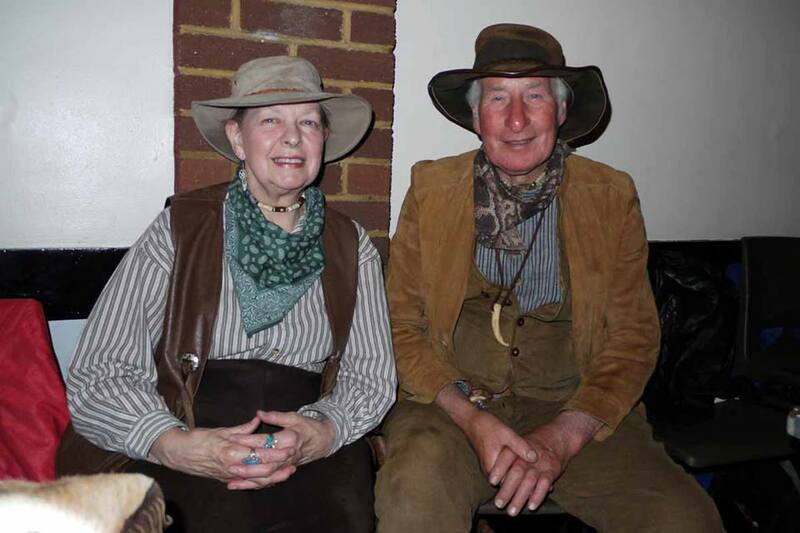 I would like to thank Tennessee Rebel for giving us a very nice evening, Ron and Lucy for organising the evening and everyone there for supporting the club. Western Renegades, Harlington Village Hall, Beds, August 2013 with Stig's Country. 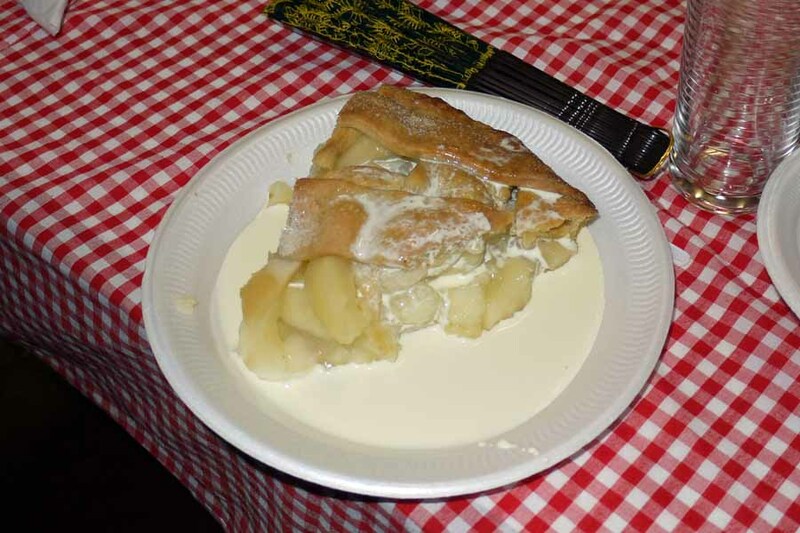 Another successful night with apple pie or strawberry's and cream for all, plus tea and coffee. Stig was on form tonight and gave us a full evening of country with many classic numbers, he also threw in some of his own favorites. Ron and Lucy work hard to put on this evening and it payed off again.. There was a great atmosphere tonight, as there usually seems to be, at this venue and as usual the evening flew by leaving Stig's Country to wind up the evening with a couple on encores, filling the floor yet again. So thanks to all for supporting the club. Dixieland CMC, Barton Village Hall, Beds August 17 with Steve Hanks. 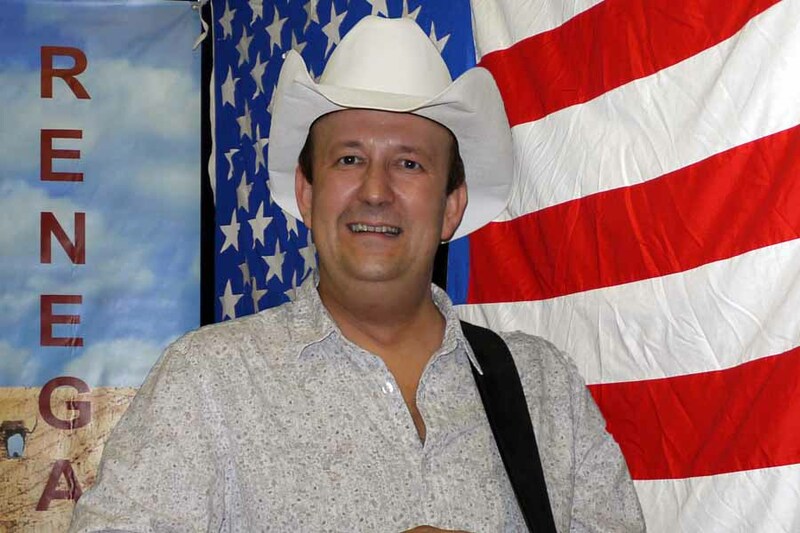 Full house tonight to welcome Steve Hanks who gave us a full evening of great country music. The dancers where happy, but in the third set they where at a loss, now and again, as to what to do. 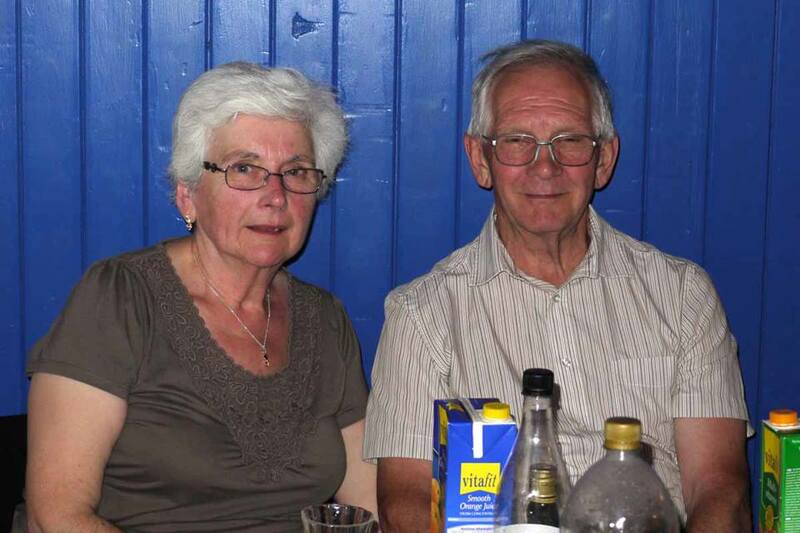 Thanks to all there for supporting the club and to Ron and Lucy for arranging a good night again. Dixieland CMC, Barton Village Hall, Beds, with The Westons. Three great artists, in their own right, now together forming the new group "The Westons", all in all, a formidable line-up. They started with an old classic Lamtarra Rumba and peppered the evening with good humoured banter and a selection of old favourites. We had quite a few beautifully performed slow numbers which, however, left the dancers at a loss, but for the listeners it was a treat. Ron was shorthanded tonight, but thought to provide cordial as well as the usual tea and coffee for all to keep rehydrated during the expected hot and humid night, and it was most welcome. We had a few birthdays in tonight, notably Tex who was celebrating his 70th and Angie (not there yet! ), both were mentioned by Paul and were treated to a now infamous rendition of Happy Birthday. In the now famous comments book everyone enjoyed the evening and look forward to seeing them again at the Christmas Party Night. Finally I would like to thank, the Westons for entertaining us tonight, every one there for supporting the club, Ron, Lucy and friends for organising the night. Dixieland CMC, Barton Village Hall, Beds, Saturday, June 15 with Andy Ash, who played to a full house tonight of our regulars, as well as some new faces, some where Westerners and others from Wescott Club. 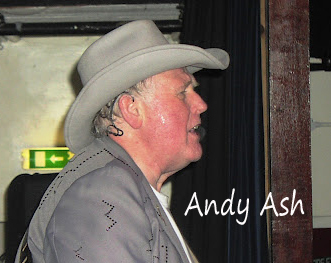 It was Andy's third visit to the club and probably not his last, as he is a really good entertainer, keeping the floor full all night with a very wide range of dancable country music. He also likes to go on the floor and sing to the audiance and has his own style of banter and jokes. Because of the numbers in tonight, it was a bit crowded at the back of the hall, which hindered slightly the partner dances, but all in all the evening went without incident. There were some good comments in Ron's book on tonights performance and I'm sure we will see Andy again. So thanks to all who attended and to Ron and Lucy and helpers for arranging the night. Finally I must also thank Andy for singing happy birthday to me, during the evening. Dixieland CMC, Barton Village Hall, Beds, 18 May 2013 with Stubby. Not his first visit to the club and on tonight's performance not his last. He played for the listeners and dancers alike with a wide section of country music to suite all tastes, from blasts from the past to more modern numbers. We also had a tribute to "Froggy" and a challenge to fit a dance to an unfamiliar tune. Although slightly lower in numbers tonight, there was a very nice atmosphere and everyone, I've spoken to, said how much they enjoyed the night and would like to see Stubby back. Well as all evening do, when you are having a good time, soon came to a close leaving Stubby to finish with a couple of encores and Ron thanking everyone for supporting the club. Western Renegdes CMC Harlington Village Hall, Beds, 25 May 2013 with Bittersweet. We were expecting to see Muddy Boots tonight, but because of illness, Chris Mezza couldn't make it, which was a disappointment to us and our best wishes go to him for a full recovery. However, it was our good fortune that Bittersweet were available to cover the evening and It was nice to meet Kerri-Jean, who is Ainsley's new duo partner. We have known Ainsley for some time and he is still as cheeky as always, which went down well, because at Harlington Ron and Lucy pull out all the stops to have a good time. It was a full house so Ron thoughtfully allocated our seats, which went down well. The hall looked the part, it was decorated with flags, lights, a new backdrop for the stage, sweets and lights on the tables. Lucy started the evening with a selection of music which had everyone up dancing, then Bittersweet, followed and gave us three sets of danceable country music. In the first break we had Hot Dogs or Cheese Dogs followed by jelly & fruit and cream. There was so much going on its difficult to sum up, except to say that everyone there enjoyed themselves and Bittersweet gave us a full evening of great entertainment. They played tunes for Tex and singled Phil out for Birthday Wishes. 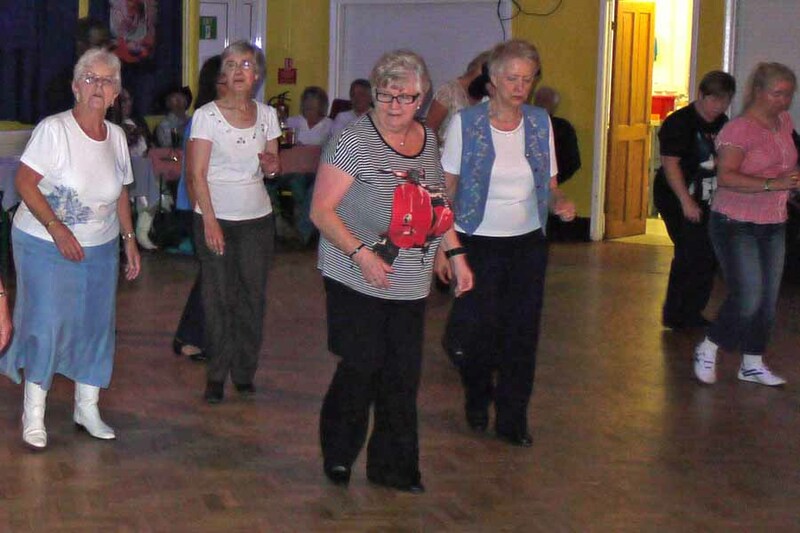 Kerri-Jean and their friends joined us on the floor for some dancing, whist still singing, Dorris policed the corners(but came unstuck when she was doing a partner dance herself). As usual, when you are having a good time, the time flew by, but even then Ainsley and Kerri-Jean didn't come off of the stage until well past 11:30, after playing requests and encores. Ron thanked everyone there for supporting Lucy's night and had to point out that already half the tickets for the next dance had been sold, so don't delay. 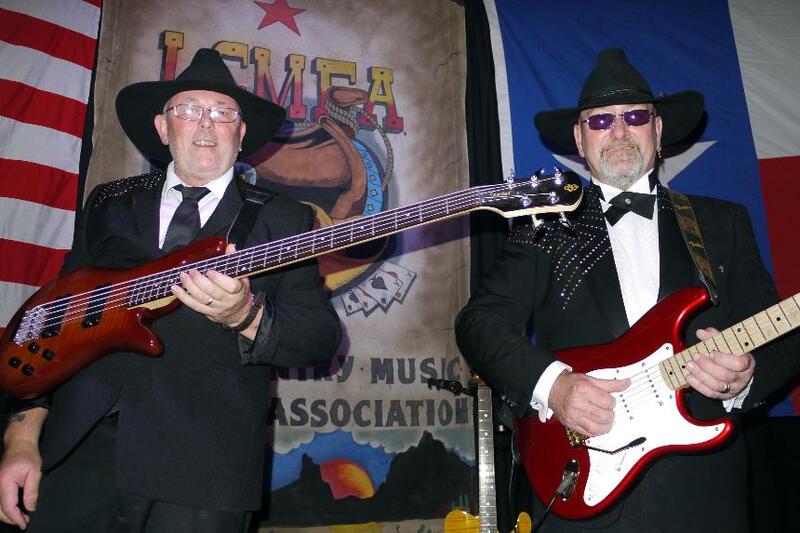 Western Renegades, Harlington Village Hall, Beds March 30, with Kenny James. I must begin by thanking Lucy and Ron and helpers for putting on such an enjoyable night, not so much an Easter Dance but an Easter Party Night. We were greeted at the door by Ron with a tray of Bucks Fizz to set the mood for the evening. We had Easter Bunnies, nibbles, boxes of sweets, quality street and Easter eggs adorning the tables. The hall was decked out as well with flags and lights. The evening kicked off with Kenny James, who gave us a full evening of danceable tunes with many of the more up to date music as well. If you have seen Kenny before you’ll know what I mean when I say that he has his own endearing style which carried us through the evening. Everyone danced the night away, not necessarily to the one he announced, but we all enjoyed ourselves. 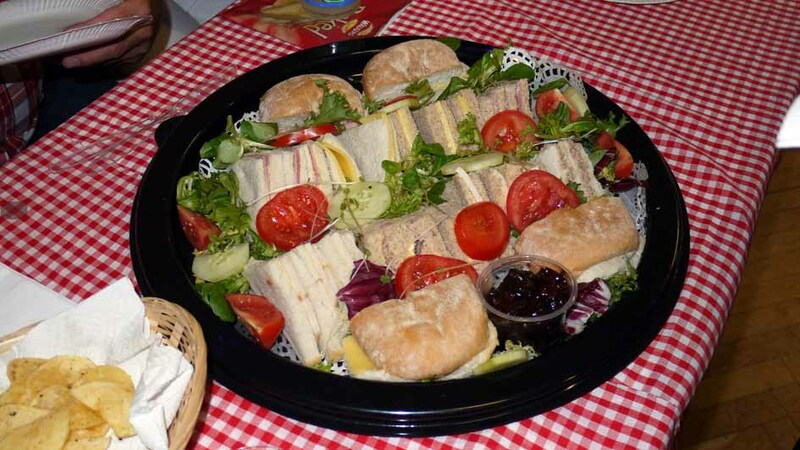 The first break was taken up with a lovely buffet on every table of small pasties, salad, sausage rolls and cheese etc. and to follow, cream cakes plus free tea and coffee. After that we needed to dance again and Kenny was there to continue with the evening’s entertainment, plus a few of his jokes. The second break was taken up with the Easter Bonnet Competition, you had to be there to see the funny side, but lots of ladies had made a good effort, and Kenny sang along when the ladies paraded around the hall. We finally had a winner (after a recount) and the grandchildren also had a prize. It was also nice to see the youngsters helping with the raffle. 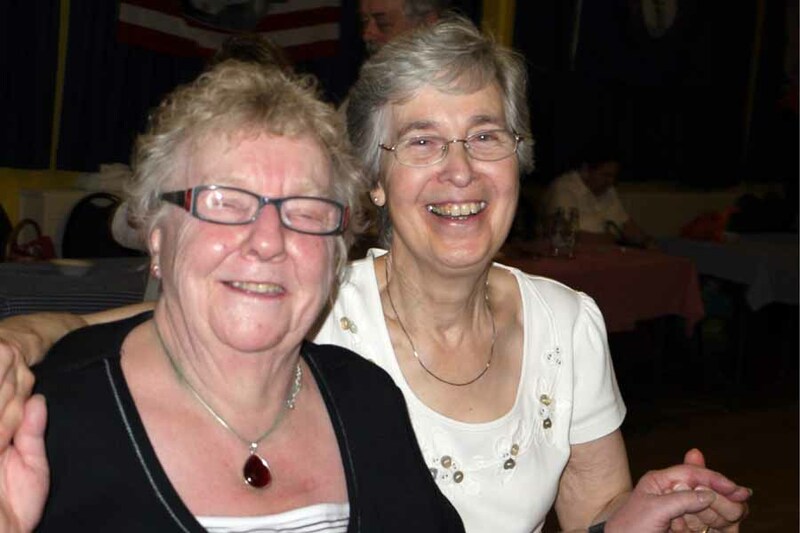 The evening was full of laughs and everyone enjoyed themselves. It was a lot of work for Lucy and Ron (and helpers) but I can say it was worth it. 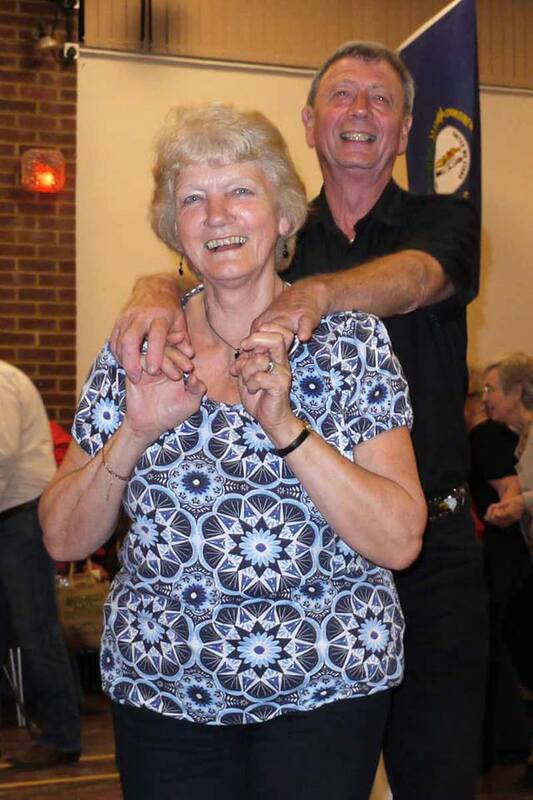 If you would like to see some pictures of the evening, visit the Dixieland web site and look on Western Renegades Page where Ron has posted some pictures. The web address is http://dixielandcmc.com/ Finally I would like to thank Kenny James for giving us an enjoyable night and to everyone there for supporting the club. Dixieland CMC March 16 Barton Village Hall, Beds with Chris Mezza. No problems writing this report, Chris is a welcome visitor to the club and never disappoints. We had a good selection of up to date numbers with a few "blast from the past" favourites, keeping the dancers and listener happy all night. You may remember that at last months meeting there was a problem with the raffle machine. Well that was faulty, as suspected, and has been repaired. Ron, good to his promise gave out free raffle tickets to people that kept their old tickets. (there were so many prises tonight, it would have been possible just to share them out). As usual, when its an enjoyable night, the time flew by and it was left to Dave to say thank you and good night to every one there. Dixieland CMC Barton Village Hall Beds with Billy Bubba King. Not a stranger to the club and always welcome, he has quite a few fans at the club who were pleased to see him again. He kept the floor full as expected and the evening went well. We had more people in than usual, which is a shame because tonight the raffle machine seemed to decide to only favour a few lower numbers. I hope this didn't put people off from coming again as Ron has promised to have the offending machine looked at and will put things right if there's a problem with it. I would like to thanks all there for supporting the club and for making it an enjoyable night. Dixieland New Years Eve, Barton Village Hall, Beds with Carl Shay. We all expect different things from a New Years Eve Celebration and all in all Carl Shay fitted the bill, a consummate artist who played all the music we like to dance too. Carl even had his fans from Harlington who seemed to have a good time following him around when he joined the dancers on the floor. The New Year was bought in traditionally with Auld Langs Syne, balloons, party poppers and there was Ron popping party streamers (which I had to sweep up). I would like to thank everyone for supporting the club over the year and look forward to another year of good country music and dancing. 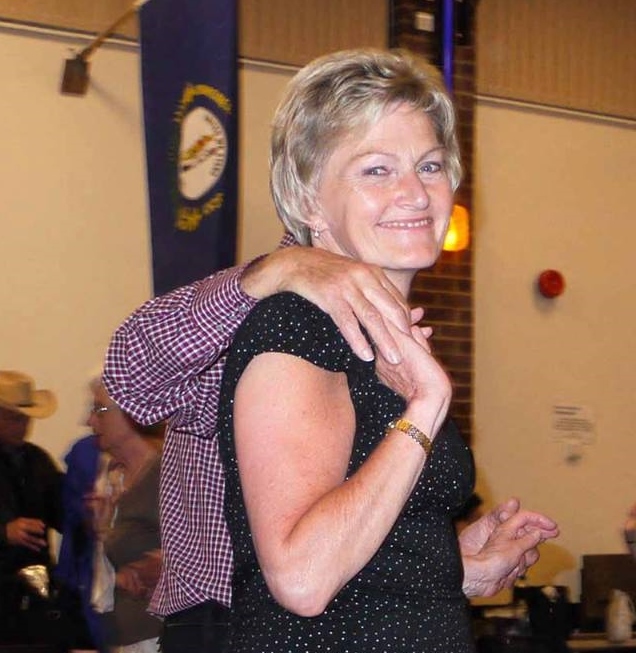 I would also like to take to opportunity to thank Ron and Lucy and their helpers for all their hard work over the year in running Dixieland and also Western Renegades. 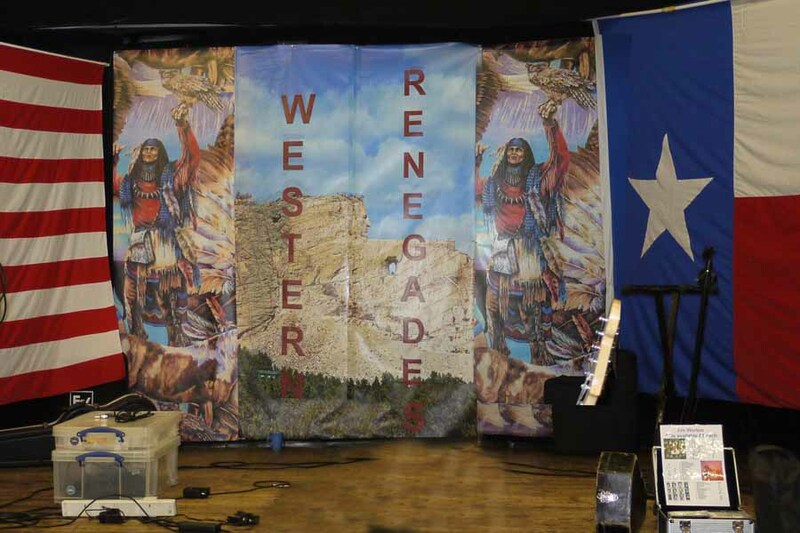 Western Renegades, Holy Ghost RC Church Hall, Luton, Beds, with Andy Ash. 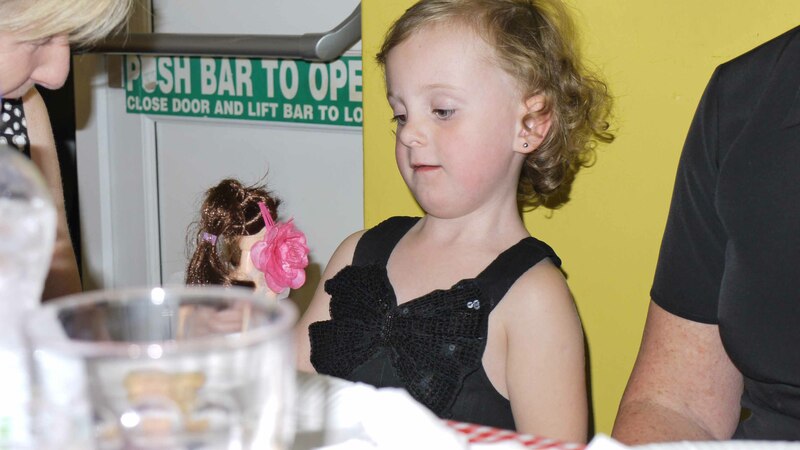 A great night was had by all at Lucy's Party Night. Andy Ash kept everyone happy with a good selection of dance numbers and we even had a few party dances. We were treated to some lovely cakes (Made by Lucy's daughter Jenny) wishing us all a Merry Christmas. Some of Lucy's classes had made a collection in appreciation of her efforts in running the classes over the year and a presented Lucy with some gifts. The evening was soon over, as they usually are when you are having a good time. Finally I would like to thank everyone for supporting Lucy and Ron during the year and would like to wish everyone a Happy New Year. Dixieland CMC, Barton Village Hall, Barton Nov 2012 with Kenny James. What a character, if you haven't seen him before you're in for a surprise. He's very knowledgeable about his country music and can keep the line dances and partners happy with his selection of songs, although he admits that he's not a dancer. Some of us thought that he wouldn't last the three sets tonight, but how wrong we were!! Kenny kept us amused all night with his banter and jokes. It intrigued Kenny when he noticed Tex, whose letting his beard grow for the Christmas, he thought he should be one of Santa's helpers. Little did he know that Tex is in fact father Christmas (I have photographs to prove it). It was touch and go if he was in fact going to finish his final set or keep playing all night (as he was in no rush to leave) He did in fact finish with a sing-song followed by a dance number, which left everyone on a high. There was a good number of people in tonight and most I spoke to said how much they had enjoyed the evening even if they couldn't get some of Kenny's joke. So thanks to all for a good night. 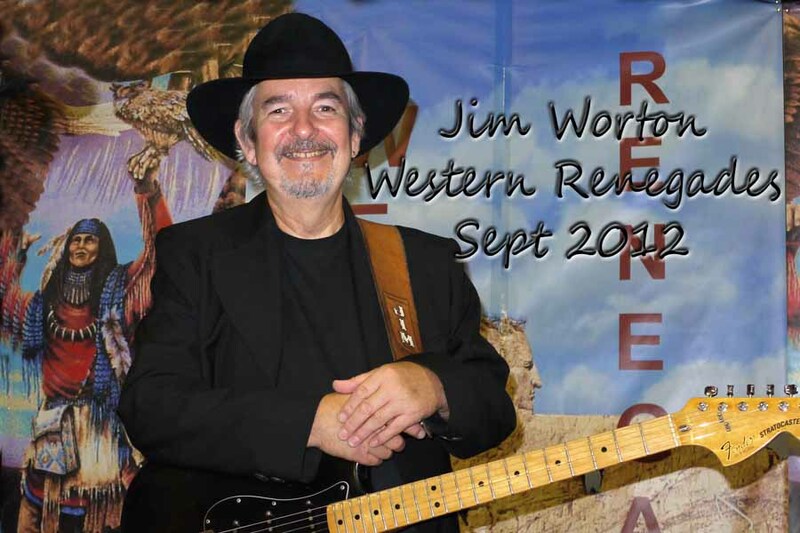 Western Renegades, Harlington Village Hall, Beds 29th Sept with Jim Worton. 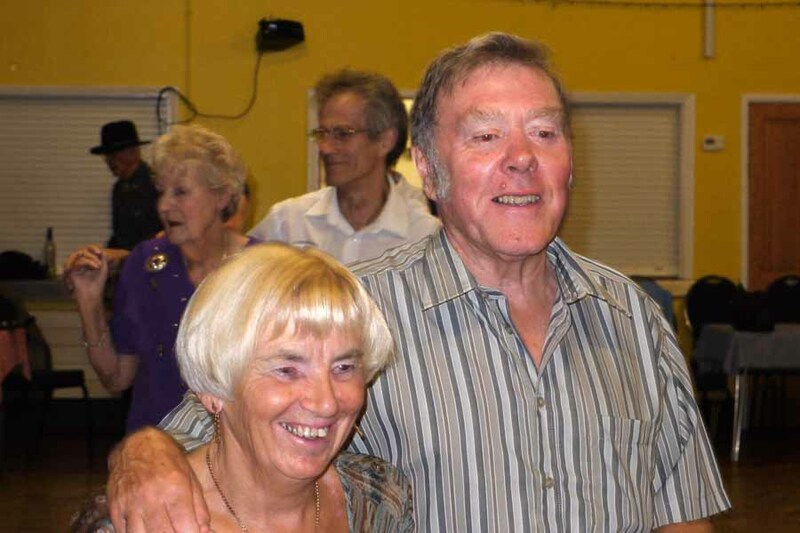 What can I say about tonight's dance, after all the hard work setting up the hall, preparing the buffet putting up the flags and lights decorating the tables, you would think that Ron and Lucy would be worn out, but none of that. 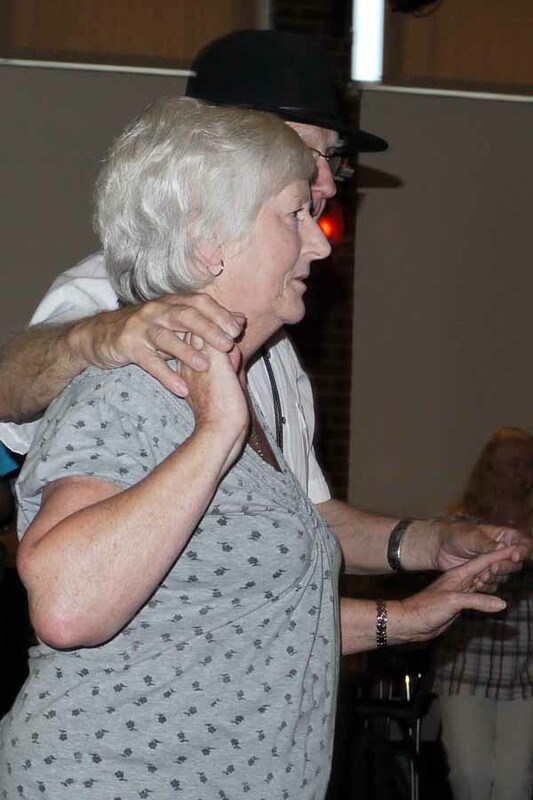 Lucy made us all welcome with an early start to the evenings dancing (we didn't have our usual MC due to illness, lets wish him well.) and the evening continued in the same way. Everyone I spoke to felt Ron and Lucy had created a very nice clubby, party atmosphere, actually that is just what they are trying to achieve. I also got the impression that Jim Worton enjoyed himself as well. 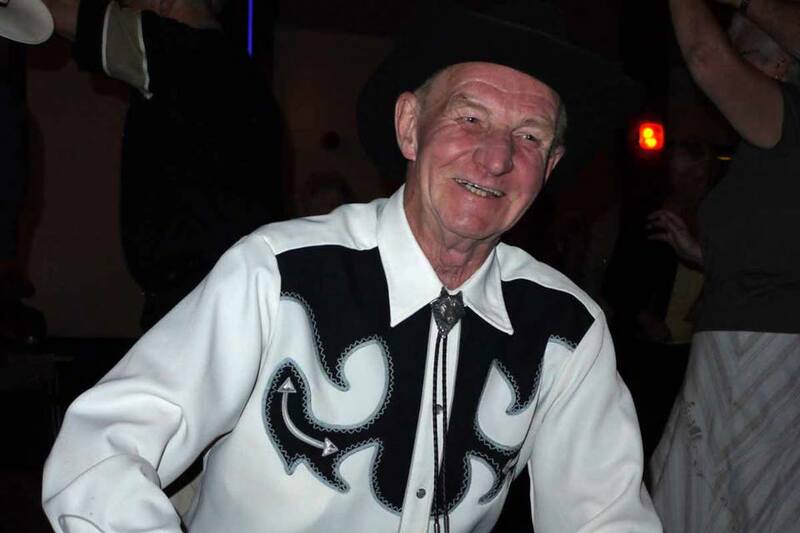 He gave us a full evening of danceable country music and gave helpful suggestions as to what dance fitted his choice of music. Jim had arranged some tunes for his mandolin which went down well, as it's nice to hear a variation in music styles. We had a full house tonight with all treated to a very professionally prepared selection of sandwiches and cakes during the first interval, followed by the raffle in the second break. The evening flew past again as it always does when you are having a good time, leaving Lucy thanking everyone for supporting the club and to Jim for giving us a memorable night. I would like to add a thanks to all who helped tidy up and to remind folks that this is a ticket only dance, due to the limited space, so please contact Ron or Lucy before arriving at the club. (you can pay on the door). Dixieland, Barton Village Hall, Beds Saturday 15th September. Unfortunately I wasn't at this Chris Mezza dance and from the comments in "Ron's Comment Book" I missed another good night. They follow the lines of "Chris, mangnificant as usual" "Good night of entertainment" "Brilliant night - we want Chris back again soon" "Great Night" "Great Night" "Another wonderful night" "Brilliant Night Come back soon" " Brilliant Night". How can I follow that except to thank everyone there for supporting the club. I do understand that the numbers where a little lower, but this gave folks a lot more room for dancing without loosing any of the great atmosphere. Thanks must go to Ron for virtually setting up the hall on his own and to those who helped to clear up. Not forgetting Chris though for giving everyone a great night, thanks again. 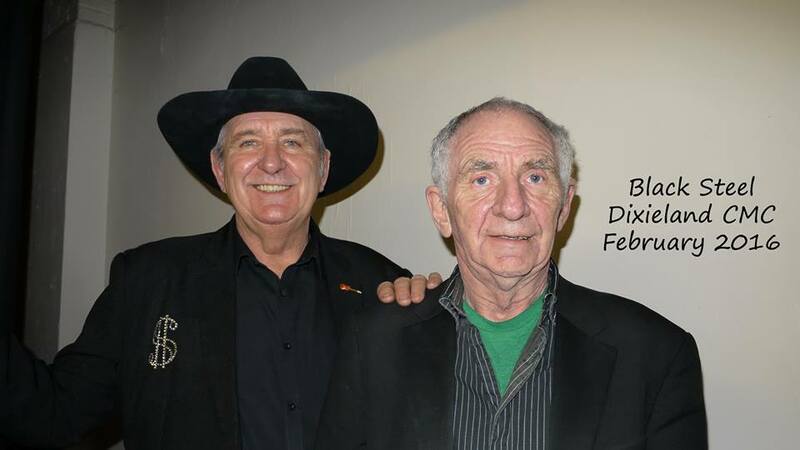 Dixieland CMC, Barton, Beds, Saturday August 11th with Rancher. It was their second visit to the club and I was looking forward to seeing them again. I wasn't disappointed, it was another great night from this very talented duo, Steve and John, who kept the dance floor full with a selection of popular country music. Their personable natures and artistry went down well with everyone, making for a pleasant night. It was the eve of Ron's birthday and we were all led by Rancher in a rendition of Happy Birthday. The evening flew past and left us hoping that we could see Rancher again some time soon. 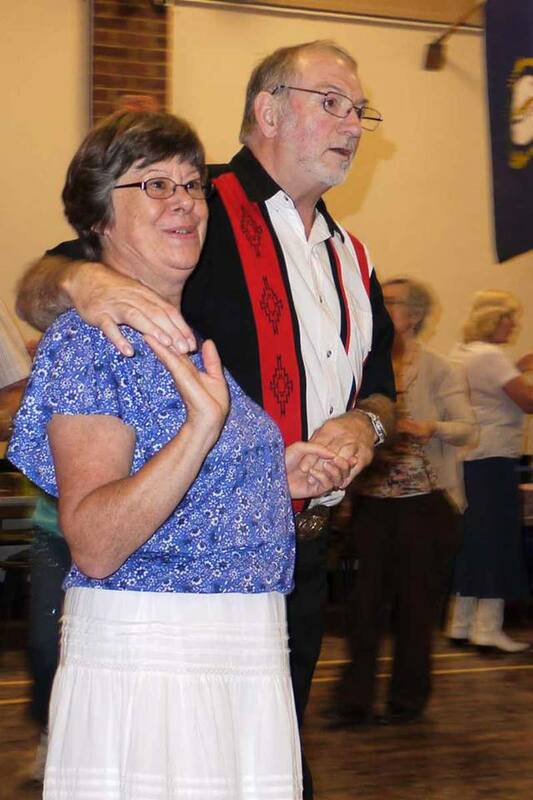 They wound up the evening nicely with, a slightly out of character rendition, of Olly Murr's Dance With Me Tonight,(One of my favourites) I would like to thank, all there tonight for making it an enjoyable evening and Ron, Lucy and committee for their hard work in setting up the hall, etc. 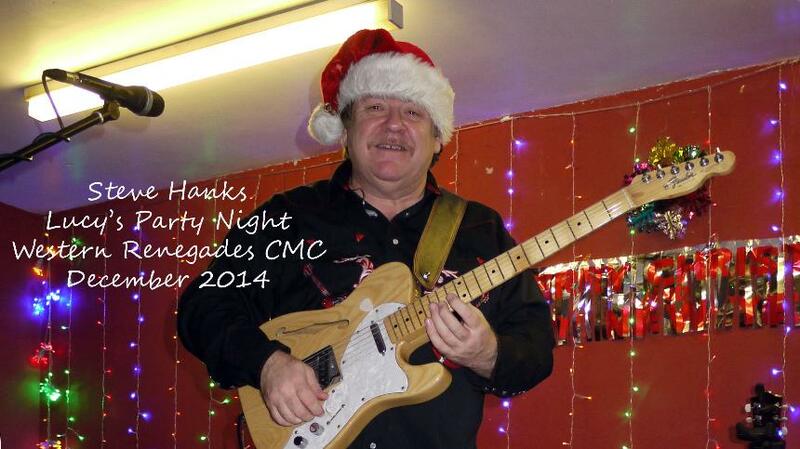 Western Renegades CMC, Harlington, Beds, Saturday August 4th with Peter Shaw. One of the ladies at the dance summed up the evening best by saying "it was a brilliant evening with a great party atmosphere topped off by a very personable artist Peter Shaw". Well what can I say after that, except that she also said that the strawberries and cream went down very well, not to mention the apple pie, that was also available. Peter played well, keeping everyone on the dance floor with a good selection of danceable music including some of his favourites. His warm and generous nature came over well at this club venue and I would be pleased to see him again. Thanks to Ron, Lucy and helpers for putting on another enjoyable night. Hope all is well with you, still not Summer yet but live in hope. We weren't at the dance tonight, but it was such an enjoyable evening Ron has asked me to compile a few words from the comments book. So here goes. Dixieland 21st May 2012 Barton Village Hall, Beds. Tonight was Andy Ash's first visit to the club and what a success it was. I wasn't at the club, but everyone I've spoken to since said how much they had enjoyed themselves and from the comments in "Ron's Comments Book" he must have gone down very well, as you can see from the following. As you can see the book was full of great comments, reflecting on a very enjoyable evening, pity I missed it. So thanks to all that supported the club and Andy Ash for putting on an entertaining evening. 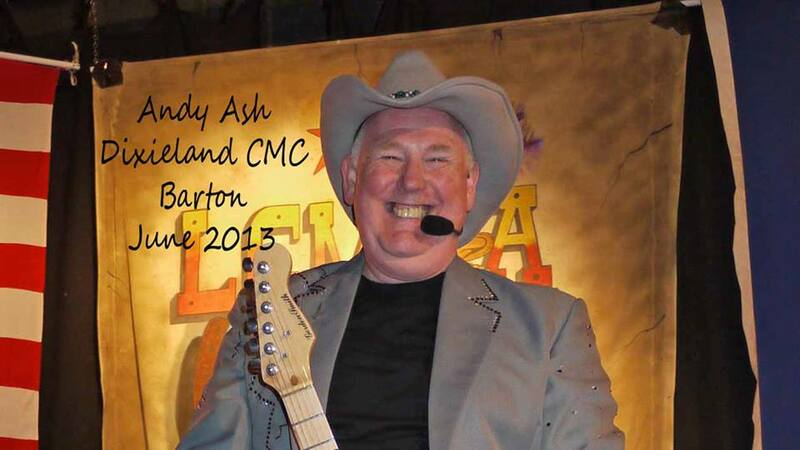 I would like to add that during the evening, Andy's wife took a few photographs and has pasted them on their web site as follows - http://www.andyashcountry.com/ - so have a "google". Western Renegades, Harlington Village Hall, Beds, with Pedro. 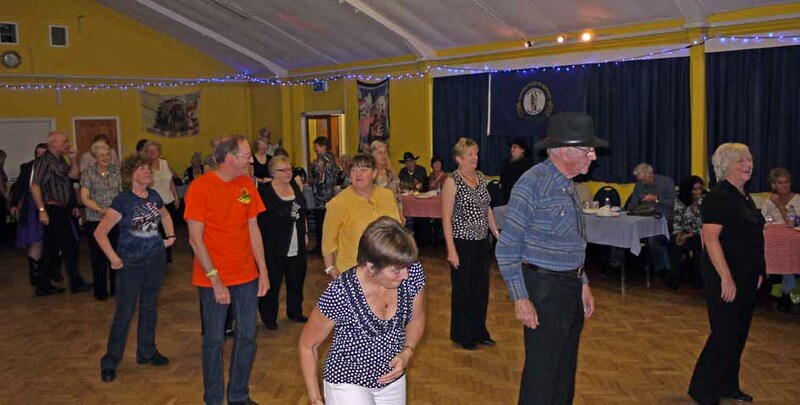 Well, another very enjoyable night at this relatively new venue in Harlingon Village Hall with Pedro giving us a full night of country music, keeping all the dancers and listeners happy. 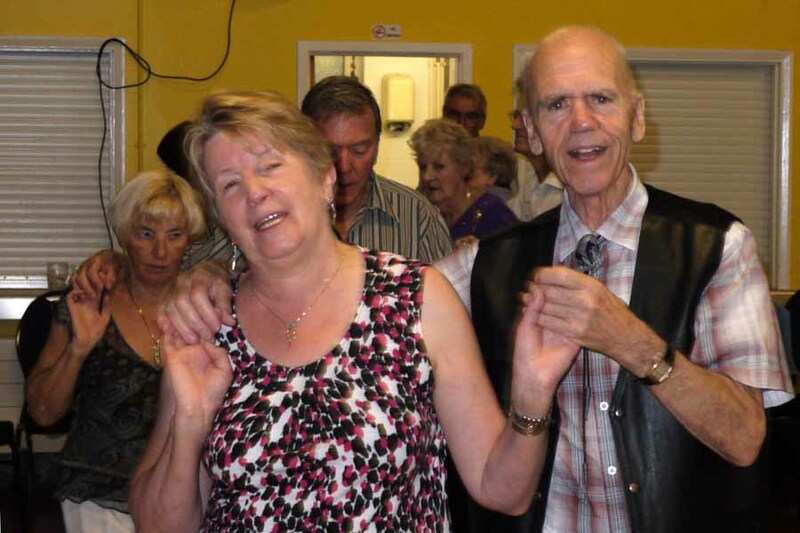 Pedro, a regular visitor to Dixieland CMC, started the evening with an old favourite, "I Just Want to Dance With You" and finished with "Kiss Off" . There was a good crowd in tonight helping to create a friendly, cluby atmosphere and It was nice to see Ron with us. He's just had a back operation and had to leave early, to rest up. During the first break we tucked into a nice selection of cheese and biscuits followed by a slice of Melon, which went down very well. Dave our MC also had to leave early, which left me to wind up the evening by thanking Pedro, everyone there, Lucy and her helpers for putting on another great evening. Western Renegades, Harlington Village Hall, Beds 31 March 2012. Our artist for tonight was Mervyn J Futter, a welcome return from his last visit to the club. The evening started at 5.30 for Ron and his helpers, the early start payed off as the hall was decked out with lights, flags, table decorations, nibbles: with the evenings buffet ready to cook by the time we all arrived. We were welcomed by Dave, our MC for the night, and with Lucy acting as DJ starting the evening off with a few popular dances to get everyone in the mood. Then at 8.15 we were introduced to the nights artist and to our surprise it was "Merv and Maria" (we had met Maria earlier, but thought she had just come along for an evening out.) 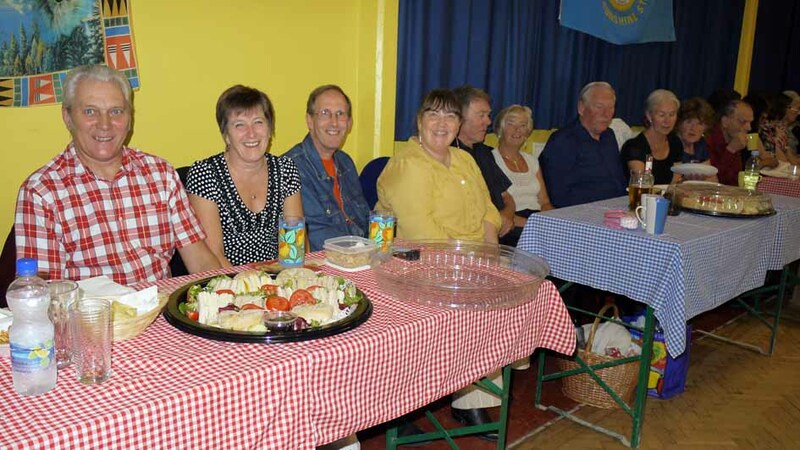 The night kicked off with a good selection of country tunes which kept everyone on the floor until the first break, when we were treated to the evenings buffet : hot dogs or cheese rolls followed by fruit and jelly. 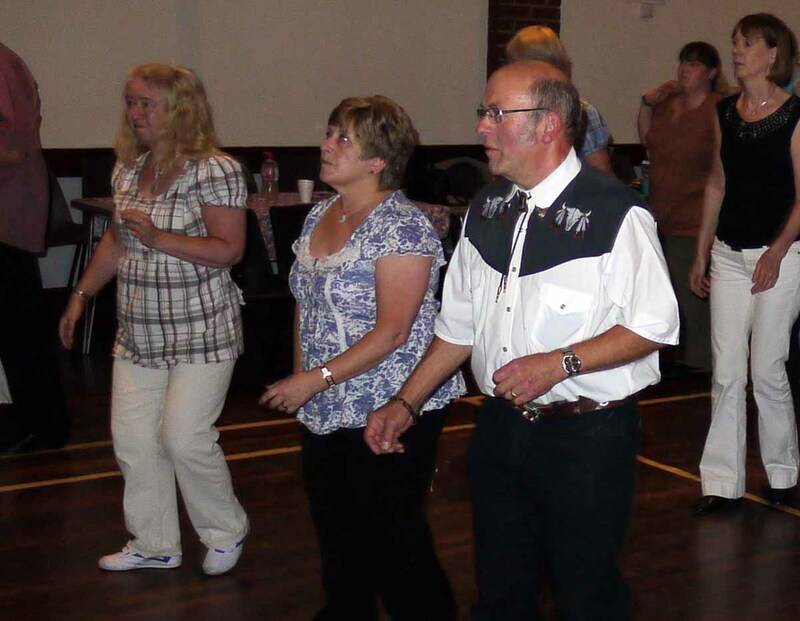 The evening continued, full of old and new country, some we recognised and some we didn't and at times we were challenged by Merv to come up with dances for the music. With the numbers limited and the seating arranged to accommodate the hall, there was plenty of room for all, It all made for a nice clubby atmosphere, were everyone joined in to enjoy themselves. Unfortunately the evening flew by and it only remained for Merv to finish with the time honoured encores and finally winding up with Galway Girls. 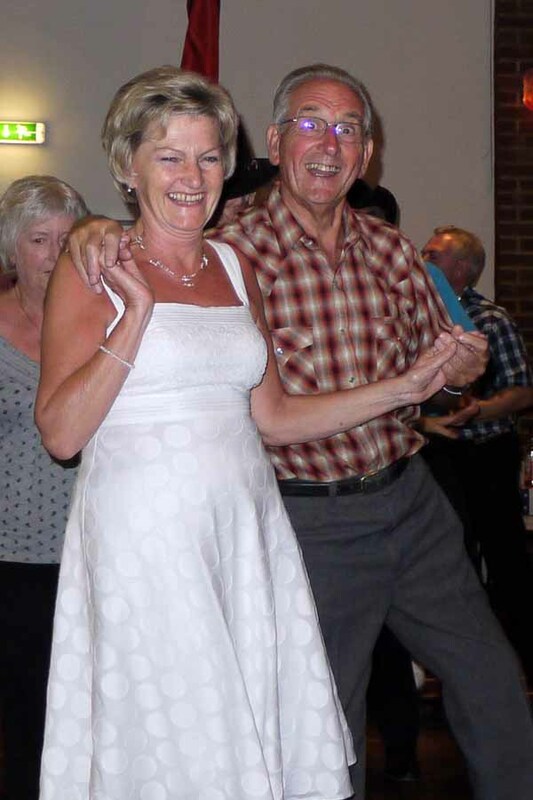 It was also nice to see Ron and Lucy enjoying themselves even though the evening must have been hard work, which payed off, as everyone I spoke to had enjoyed themselves. So thanks to all the helpers and everyone else for making it a good night and best wishes to "mum to be" Maria, whose soon to make Merv a Grandad. Dixieland CMC Barton Village Hall, Beds. 17th March 2012 with M.T. Allan (currently chairman of the BCMA and MCMHoF) We arrived late to tonight's dance, which is unusual as we are normally quite early. However, it was great to come into a hall full of dancing, with an artist of M.T. Allan's calibre on stage singing a favourite from the past "Just a Kiss". The atmosphere was great. Malc was on form tonight and we were treated to a few jokes (although even he felt some were not worth retelling) still we had a laugh. The night was full danceable country music, a few from the past, but very enjoyable and this was reflected in Ron's "comment book" with some very nice remarks about M.T.Allan. This personable Yorkshire man gave us elocution lessons as well as pointing out that its worth getting in early, if only to see how much Ron has to struggle to get the flags up. Dave, our compare, (who has just celebrated another birthday) added that we are now able to follow the clubs antics on line with Facebook and there is also a Web site. However, as with all good nights, it came to a close all to soon, and even now MT Allan's sense of humour didn't flag, with "door" instead of "encore" (don't ask me to explain). After some "doors" we finally finished on a high with us disappearing to "Disappearing Bubbles". So thanks to all there for supporting the club and making it an enjoyable night, and to Ron and the committee for all their hard work. Livewire, Ainsley and Debbie, a very talented duo making tonight's report on the night very easy, although a bit difficult to find the right superlatives for the occasion. Ron, our MC for tonight, reminded us at the start of the evening of the floor etiquette, and by and large the evening went well. Although, we were probably on our best behavior, because Ron said that if any chairs were left unti...dily, a fine of 10p would be made which was to go to charity. (His collection box remained empty though). We started with a modern dance, "Kiss Off" danced to "If I Was a Woman", and ended with a blast from the past, "Love Letters" danced to "Strawberry Wine". 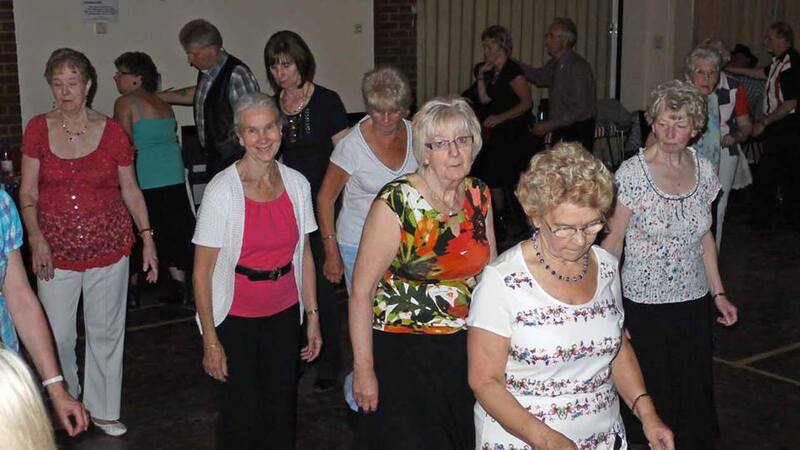 The evening flew past with some old favourites like Patient Heart, Seven Nights to Rock, Side by Side, and more up to date dances like "Don't Drink The Water" too many to list, but all keeping the dancers very happy. Also It didn't matter who I spoke to, everyone said how much they were enjoying the evening and how well Ainsley and Debbie sang together. Ainsley was on form tonight: we had a competition for the best dancer,(although he forgot to award one - probably distracted by everyone singing happy birthday to him at the end of the evening) and we had a taste of his sense of humour, at one time he tried to wear us out with a trio of lively dances. Unfortunately, the evening was all to soon over, coming to a close with a few encores and Ron to thanking Livewire for entertaining us and everyone there supporting the club. We also all had a group photo taken in front of the stage, which has found its way onto the new web site that Ron is creating for the club. So quite an enjoyable and eventful night.